How does a shatteringly simple-minded pop song resonate down the ages? How does it palpitate its way into a most unlikely list of others mediums, other countries? 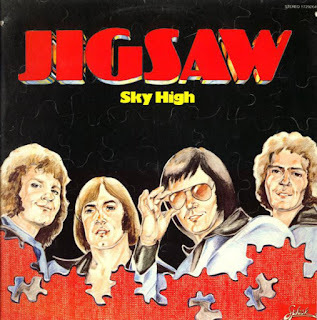 When you think of "Sky High," a 1975 hit for the English band Jigsaw, written by Clive Scott and Des Dyer. I think of what pushed me over the edge into the arms of the Dolls, the Stooges, the Ramones. "You've blown it all sky high/By telling me a lie/Without a reason why/You've blown it all sky high . . ." We mocked it as we drove down the road in our Trans Ams (OK, I had a Beetle). It layered the band's funk with an overpowering orchestral arrangement by Richard Hewson and an inordinate amount of vocal reverb and wah wah pedal. The result is a stupefying firestorm of lush sound that made the unrefined, literally unprocessed thrash of punk much more attractive to the ear. And yet -- it was big in Japan, HUGE in Japan. In fact, it was ripped from the soundtrack of a film I'd dearly love to see in the revival house. It's the first Australian-Hong Kong co-production, The Man from Hong Kong, a kung-fu/exploding-car actionfest. IT co-stars, appropriately, Australian one-time James Bond George Lazenby as the the bad guy ("gun runner, dope peddler, ruthless czar of international evil" -- quite a job description! this villain can multitask) and Hong Kong's Jimmy Wang Yu, who made his name as One-Armed Swordsman (1967), The Chinese Boxer (1970), and in The Master of the Flying Guillotine (1976). (Wuxia [Chinese martial arts] film fans will recognize the great Sammo Hung as a subordinate baddie; he handled the fight choreography for the film.) 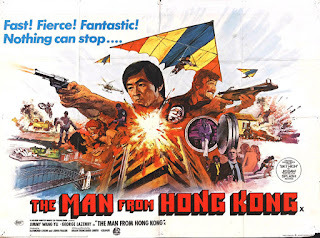 The film's poster features a rainbow hang-glider, a sure sign it was filmed squarely in the center of 1975. And, somehow, it became the ring-entry theme for one of the three great masked Mexican wrestlers, luchador Mil Mascaras (Thousand Masks). Who is also big in Japan. Popular culture seeps out in unlikely places. How do these things happen? Interesting, but it makes my head hurt after a while. The unlikely survival of "Sky High" in so many dimensions tells us that our creative efforts may find a niche someday. You simply have no say in how that plays out.